Robothorium: Sci-fi Dungeon Crawler Robothorium is a cyberpunk dungeon crawler from Goblinz Studio, with turn-based fights, where all your choices will have a direct impact on your revolution against Humankind. Choose your allies and manage your reserve of robots. Craft and gather powerful items, upgrade your talents and give your support to demonstrations all around the world. Develop your strategy with 8 classes of robots, each one having its own synergies. Face plenty of enemies designed with unique mechanics and defeat the BreakTech enterprise. Each of your choices will impact random generation and the next missions. They will also change your relations with the 5 different factions present in the game. If you get stuck in the game, check out the video walkthrough and gameplay for the game. 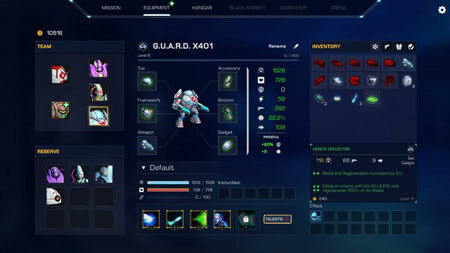 This entry was posted in PC Games, Walkthrough and tagged Robothorium Cheats, Robothorium Gameplay, Robothorium Guide, Robothorium Strategy, Robothorium Walkthrough by Marvin. Bookmark the permalink.